Join us in welcoming one of the most impressive vehicles to enter the automotive landscape this season: the 2016 Jeep Renegade. Not only does this powerful Jeep boast epic performance specs, including a herculean engine, unbelievably high rates of fuel economy, and a raft of driver assist features to improve your control over the ride, but it also promises a wide range of technologies to keep you and everybody else on board as entertained as possible, while also giving you access to the very latest in information technology and connectivity systems. 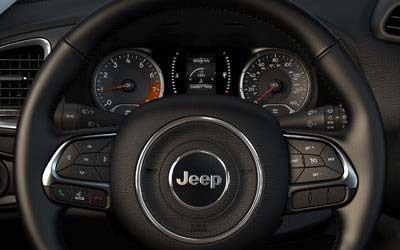 Meanwhile, the Jeep is an impressively safe vehicle, coming outfitted with a slew of safety devices designed to ensure that you and your passengers remain protected no matter what driving conditions and challenging weather you might find yourself facing. Finally, this Jeep Renegade is also an astonishingly affordable vehicle, entering the market in a range of trims, each of which is priced at an eminently low price. 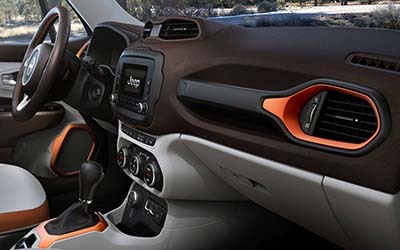 And here’s the best part: you can experience the 2016 Jeep Renegade yourself by visiting out dealership today. 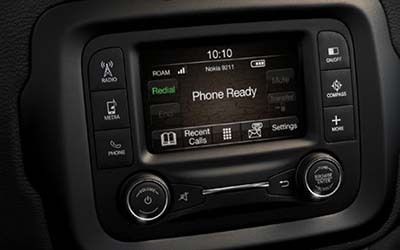 But before you do so, let us fill you in on some of the more exciting details regarding the 2016 Jeep Renegade. 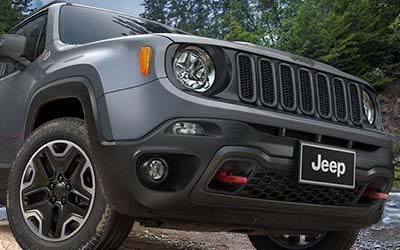 Jeep is evocative of few things as much as power, and in this key area the 2016 Jeep Renegade does not disappoint. 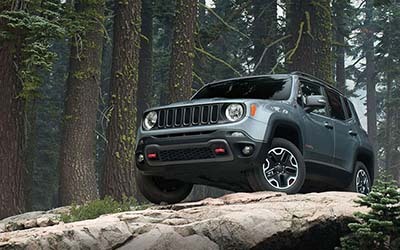 Giving drivers a choice of colossally powerful engines that grind out massive amounts of horsepower, the Renegade ensures you an epically high-performing ride, but it also guarantees smooth, safe driving with top-notch transmission and suspension systems as well as a host of driver assist features. For starts, the Renegade comes equipped with two powerful engines: either a 1.4L I4 MultiAir Turbo Engine or an available 2.4L I4 MultiAir Engine. 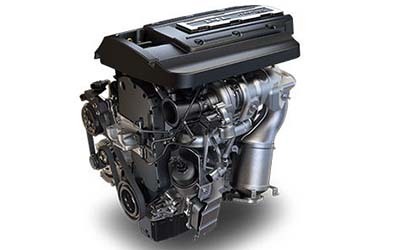 In addition to grinding out massive amounts of horsepower, both engines also feature a MultiAir technology system that helps ensure sky-high rates of fuel efficiency while also reducing emissions rates. AND these powerful engines guarantee that you’re going to get epic amounts of towing capacity. For example, in most trims you can bet on being able to lug as much as 2,000 pounds of trailer, boat, or more up to the lake or out to the farm. But the Renegade balances out all this engine force with a selection of transmissions systems designed to keep your drive as smooth and your experience on the road as seamless as possible. 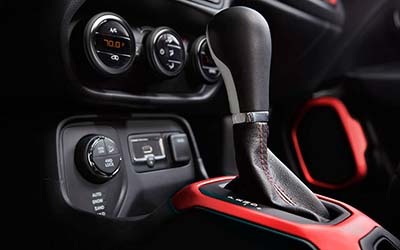 On the one hand, you can opt for a 6-Speed C635 Manual Transmission system for increased control, or you can go for a 9-Speed 948TE Automatic Transmission system for even easier operating. 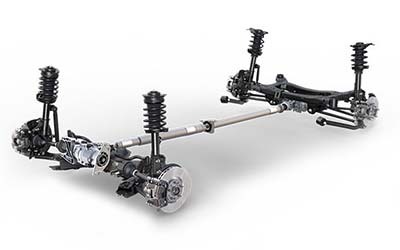 In its normal configuration, the Jeep Renegade features a dependable front-wheel-drive system. But depending on your trim, you’re also going to be able to get one of a set of powerful 4×4 systems. For example, the Trailhawk and a number of the other trims boast Best-in-Class 4×4 capability, with a Jeep Active Drive Low 4×4 system to optimize your Renegade’s off-road performance. Yet in addition to the Renegade’s engine power and choice of transmission and 4×4 systems, this vehicle also boasts a slew of driver assist systems to improve its performance in all conditions—so many, in fact, that it’s difficult to know where to start in listing them. 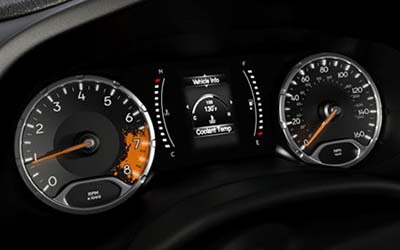 But here are two: on the one hand, the Renegade’s Hill Start Assist system will simplify the process of starting the Renegade on an incline, while on the other hand, Electronic Roll Mitigation, for example, prevents your from losing control of your Renegade when you’re driving on the highway at breakneck speeds. Sure, most vehicles these days boast traction control systems. 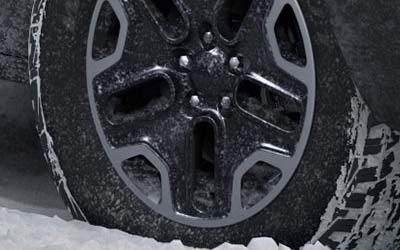 What’s distinctive about Selec-Terrain Traction Control is that it allows you to choose your own traction settings depending on the road conditions in which you find yourself driving. 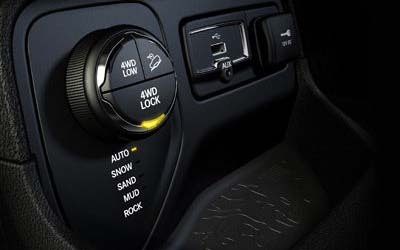 With five settings in total—Auto, Snow, Sand, Mud, and Rock—you’ll be able to select the right traction configuration for any drive. On the basis of its impressive performance-enhancing devices and systems, the Jeep Renegade has received a Trail Rated badge, meaning that Renegade has passed a slew of tough tests designed to determine the strength of the Renegade’s performance when it comes comes to off-road capabilities in particular. Needless to say, the Renegade is impressive. But in addition to the Jeep Renegade’s awesome performance specs, this car also promises drivers a well-protected, secure experience on the road, coming packed with a host of safety systems designed to keep you and everybody else on board as safe as possible, whether you’re off-roading near the Dunes or hurtling down the highway downstate. With great power comes with great responsibility, and in this area especially, the Jeep Renegade does not skimp. For example you’ll get a wide-ranging collection of airbags, including Advanced Multistage Front Airbags, a Driver-Inflatable Knee-Bolster Airbag, Supplemental Front Seat-Mounted Side Airbags, and Supplemental Side-Curtain Front and Rear Airbags. Yet at the same time, the Renegade also features an Occupant Detection system than enables it to determine when the deployment of airbags is called for, rendering the vehicle’s response in the case of a collision even more sensitive. With its well-designed Electronic Stability Control system, the Renegade can ensure that you remain as stable as possible when you’re traveling at high speeds on the highway, thereby better enabling you to avoid losing control of your vehicle in treacherous conditions. 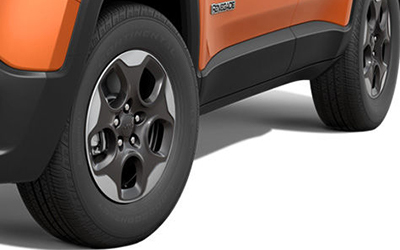 Not only does the Renegade keep you stable and ensure that your traction remains optimal, but it will allow you to keep a close eye on the status of your tires by giving you the lowdown on their air pressure with a Tire Pressure Monitor that keeps you apprised of your Renegade’s tires’ vital stats without requiring you even to leave the cabin. 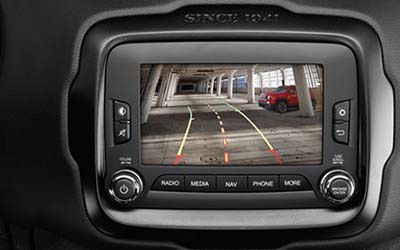 In addition to all this, the Renegade is equipped with a ParkView Rear Back-Up Camera that provides you with a comprehensive image of the area behind your car and giving you audible signals when you’re approaching too closely another vehicle and allowing you to parallel park with simplicity and efficiency. In the event that a collision seems unavoidable, the Renegade can sense the immediacy of a danger and apply its own measures to try to avert it with Panic Brake Assist, which allows the car to deploy maximum braking power without your direction in order minimize your stopping distance. But the Renegade also provides a bevy of assist features that make the vehicle easier to function as well as safer. 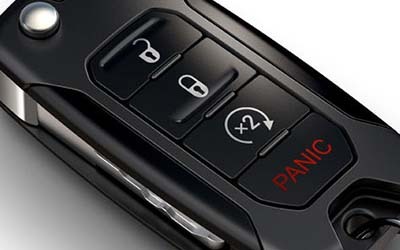 These include, for example, its Remote Start System, which lets you turn the car on from a distance, preparing it for your entry and getting the journey started with minimal effort. 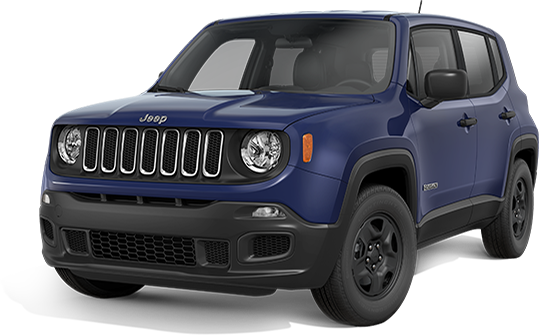 Finally, the 2016 Jeep Renegade offers drivers a memorably comfortable and luxurious drive, boasting ample seating and passenger volume, as well as a generous amount of volume for cargo and an impressive degree of versatility as well. 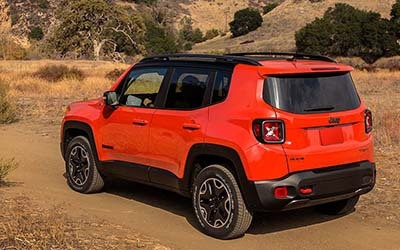 In addition to all this, though, the Renegade boasts an array of convenience features to increase your enjoyment of your ride and provide you with a wealth of technologies to keep you and everybody else on board as engaged, entertained, informed, and connected as possible. 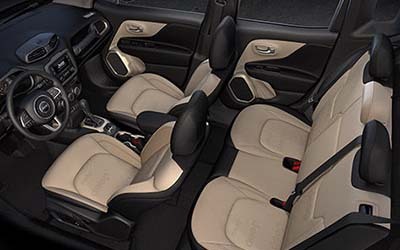 Not only does the Jeep Renegade give you a generous amount of seating, but it also makes sure that it’s comfortable. For example, the Renegade gives you a choice between premium cloth low-back bucket seats and available Lux leather-trimmed bucket seats, but it also features a front-passenger’s fold forward seat with a soft back and a manual 6-way driver seat and 4-way passenger seat. 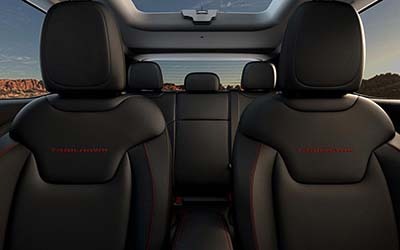 Likewise, the Renegade’s interior is impressively versatile, giving you rear 60/40 folding seats to allow you to choose how to best apportion the amount of volume in your vehicle’s cabin and maximize space for either passengers or cargo. You’ll even be able to adjust the height of seats with specially designed seat height adjusters. In addition to interior comfort, the Renegade also gives you an especially luxurious cabin experience with its gorgeous interior LED lighting system, which boasts ambient lights that allow you to set the mood in your car’s interior depending on your own personal preferences. With the Renegade’s UConnect 6.5 Nav system, you’ll be able to keep track of your location no matter where you find yourself. Not only that, but you’ll be able to generate route maps, retrieve information on traffic patterns, and gain access to a wealth of information that will allow you to simplify your drive and enable you to make smart decisions about your plans. Likewise, the Renegade boasts a colossally powerful sound system that promises to keep the tunes playing throughout your drive. 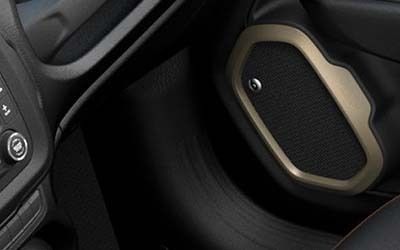 With its six carefully designed speakers, you’ll have access to the latest in sonic technology, and you can count on a drive as enjoyable as it is safe and comfortable. Not only that, but you’ll be able to operate this sound system (and many more of the Renegade’s functions) using a beautiful and easy-to-use 5.0-inch touchscreen display, with which you can adjust the volume, make track selections, and much more. But of course you’ll need something to play on your speaker system, and in this area, too, the Renegade does not disappoint. Not only will you get HD Radio and SiriusXM Satellite Radio, which deliver a wide range of streaming internet radio options, but you’ll also have an integrated voice command system with Bluetooth capabilities as well as UConnect 5.0, which will let you plug your smartphone into your car, giving you access to all the music you have on your phone as well! And if you’re running out of power on your smart device, just plug it in to one of the Renegade’s USB ports to recharge it with no trouble whatsoever.